Sing to Your Child. In movies, a lullaby can be somewhat magical in its sweetness between a mother and her child. Some young mothers have even been known to sing to their child while they are still pregnant. For small children, a simple song shared by the family can be a significant thing – even if you sing badly, or it’s just a silly lullaby. Play/Listen to All Kinds of Music. - For some people, it’s second nature to hum a song as they do chores around the house or press play on their Pandora station as they drive. Having music in the atmosphere of your home or car can produce positive energy. Remember to listen to a variety of music – you never know which kind your child will like best! Dance with Your Child. You might feel silly—you might even look silly—but your kid probably sees you as a rock star. Put on your favorite tune, grab your kid and have a dance party. It’ll be fun and create a sweet and silly memory for both of you. Put Actions to Songs. Kids love fun DVD’s with songs and motions. You can buy or rent these for a fun afternoon. Or if you’re feeling creative, pick one of your kid’s favorite songs and make motions of your own. Most little girls love to create motions to Disney tunes. Share Your Favorite Music. While listening to your child’s favorite music is fun, show them something new that you love, too. They may fall just as in love with Broadway, Oldies or Gospel as you! Create Music Together. Use whatever you’ve got—pots and pans, cheap toy guitars or even just stomp and clap. Sing and make noise to create something entertaining and unforgettable together. Watch Movies With or About Music. As you probably know, media has a huge effect on people. Watching a movie or TV show that has music or is about music might inspire your child to learn more or create music of their own. Most kids love Disney musicals or movies like the Muppets. Take Your Child to Musicals/Concerts. Of course, whatever you take them to should be age appropriate, but seeing something live and up close is certainly exciting for your kid at the very least. Use Parental Guidance. Remember that music has an incredible impact on kids – it’s one of the biggest categories of industries that shape society and culture in the world today. Think about the messages of the songs that you share with your child before you share them. Make sure it is something that aligns with the values you would like to reflect (and one day have your child reflect as an adult). If your child has shown great interest in music and is itching to learn more or develop skills – go for it! Help them hone in on their interest and understand that it may be a bumpy start, but it could lead to great opportunities in the future. Join a Parent/Child Class. For younger children, start them out in a parent/child music education class. Classes like this can help introduce different concepts of music in an entertaining way for both you and your child. Start Music Lessons. 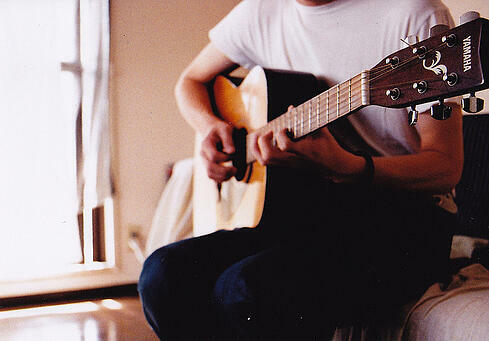 As they get older, allow them to take some ownership by enrolling them in music lessons. These can be extremely helpful and enjoyable for kids as they grow their musical abilities and learn from an instructor. Encourage performance. Is there a talent show at your kid’s school? Does your church have musical groups for kids? Do you have mini shows for grandparents or relatives? Whatever your situation may be, encourage your child to take the opportunity to perform in front of people. Help grow their confidence and abilities as they do so. As you grow in this area of parenting, and your child grows in their musical interests, make this time a memorable one! Keep in mind that your child will not share the exact same interest as you and have fun as you discover new music groups and also share your love for older ones. 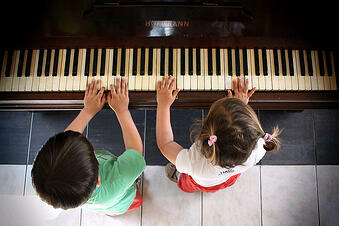 What are ways you and your child enjoy music together?